HONG KONG, CHINA--(Marketwired - Apr 26, 2017) - Artesyn Embedded Technologies has unveiled the latest in its portfolio of SIL4 COTS computing systems for rail safety applications, the ControlSafe™ Carborne Platform. Designed for onboard applications such as automatic train protection (ATP), automatic train operation (ATO), and positive train control (PTC), the new platform can also be used in wayside train control and rail signaling implementations. The ControlSafe™ Carborne Platform leverages the same safety architecture and technologies as Artesyn's ControlSafe Platform and ControlSafe Expansion Box Platform, to provide a highly integrated and cost-effective solution for rail system integrators and rail application providers. The first two platforms in the portfolio have been both certified to SIL4, while SIL4 certification of the ControlSafe Carborne Platform is anticipated to be complete in Q3 2017. 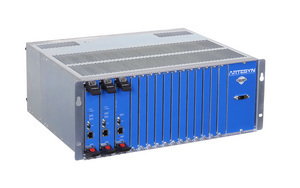 Housed in a compact 4U chassis with front access I/O and a DC power supply, the ControlSafe™ Carborne Platform can accommodate up to 12 I/O modules and a variety of I/O types. An innovative data lock step architecture, used in all Artesyn ControlSafe Platforms, allows customers to make seamless technology upgrades while a hardware-based voting mechanism allows for application software transparency. Designed to meet rail functional safety, reliability and availability requirements, the ControlSafe™ Carborne Platform is ideal for deployment in safety application environments and can save customers a significant amount of time, cost and risk associated with the system development and certification process by using a COTS product. "We have a customer who has adopted the ControlSafe Platform and estimates that they have saved millions of dollars and many years of development time," said Qianqian Shao, marketing manager for Artesyn Embedded Technologies. "A shared safety architecture makes it easy to transfer applications between systems and deploy as a common platform. This innovative data lock-step architecture and hardware-based voting mechanism supports high performance modern processors, and is modular, scalable and designed to seamlessly accommodate additional I/O interfaces as well as new processor architectures that will be required throughout the product life cycle." The ControlSafe Carborne Platform is designed as a common base platform to enable a variety of applications through the integration of Artesyn IOU modules. In addition, Artesyn offers customers the flexibility to develop IOU modules and specify I/O backplane connectivity to meet their specific needs by providing all necessary technical specifications, product support and service.